Our FH adores candles - the soothing moods they create, the warmth they add to a room, the wonderful atmosphere from the shadows flickering on the walls - she loves it all! If we lived in the US we think she'd probably be outbidding every one of you for ALL these candle packs! 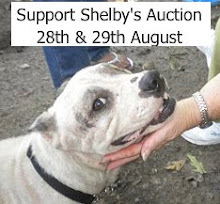 So make the most of us NOT living in the US and secure a lovely treat for your humans with a lovely treat that we are delighted to be able to offer for auction! This particular candle pack is entitled "in the mood...or not!!" and contains a brass bedroom taper candle holder. Back in the olden days, the husband would light the taper candle and leave the room for his wife to make the decision to either blow it out (not in the mood) or leave it lit (he's a lucky man tonight)!! The brass candle holder comes with 4- 6" unscented light blue taper candles. Go on, place a bid and if you're the lucky pup who wins put yourself to bed early and let this strange human romance routine begin.....!! ONLY 1 AVAILABLE - BID NOW (STARTING PRICE $10.00) BY LEAVING YOUR NAME AND BID PRICE IN THE 'POST A COMMENT' SECTION BELOW - AND FEEL FREE TO CONTINUE TO BID SO THAT YOU OUTBID YOUR FELLOW CONTESTANTS!! 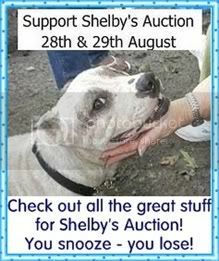 WE WILL CONTACT THE HIGHEST BIDDER WHEN THE AUCTION CLOSES.